Last weekend we went to Nova Icaria Beach in Barcelona to witness one of the weirdest events you can think of: dog sleds racing on the sand!. It was the Pirena 2007 show. Skillful mushers, huskies, harnesses...but no snow, not even a flake!. In fact it was quite warm. We arrived late so we couldn't enjoy the whole thing. 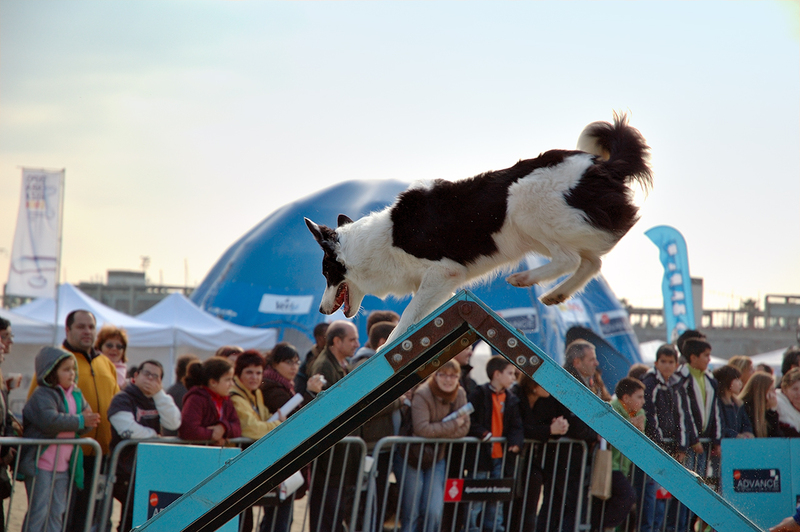 At the end there was a side contest where participants made their trained dogs run through a set up circuit of hurdles, tunnels and slides such as the one in the picture. Some of them went really fast so I had another chance to practice speed photography. And a beautiful smile on the dog too! I think it is a sheep dog - they are really nice dogs.